Waldorf Music has announced a full production launch and general availability of Kyra — the world’s first fully FPGA (Field-Programmable Gate Array) powered synthesizer featuring 128 voices (regardless of settings and effects), each with 10 oscillators per voice, and eight-part multitimbrality, based on the Exodus Digital Valkyrie previewed at Musicmesse. Kyra is initially scheduled for full production launch at The 2019 NAMM Show, January 24-27, in Anaheim, California. While the demo for Valkyrie looked a bit too much like an Access Virus, clearly the Kyra looks more in the vein of a classic Waldorf keyboard (from the single teaser image, at least). The design spec of the new instrument offers 10 oscillators that can be doubled to 20 by using two voices; each offering a wide range of features, including true stereo operation, hard sync, FM (Frequency Modulation), and ring modulation. Kyra’s resonant filters are accurate oversampled emulations of classic analogue ladder filters with 2- and 4-pole configurations (offering -12dB/oct and -24dB/oct of magnitude decrease, respectively). There are three envelope generators, three stereo LFOs with 64 shapes and MIDI clock sync, an arpeggiator, full keyboard microtuning, and true polyphonic portamento, as well as a comprehensive 18-channel modulation matrix. 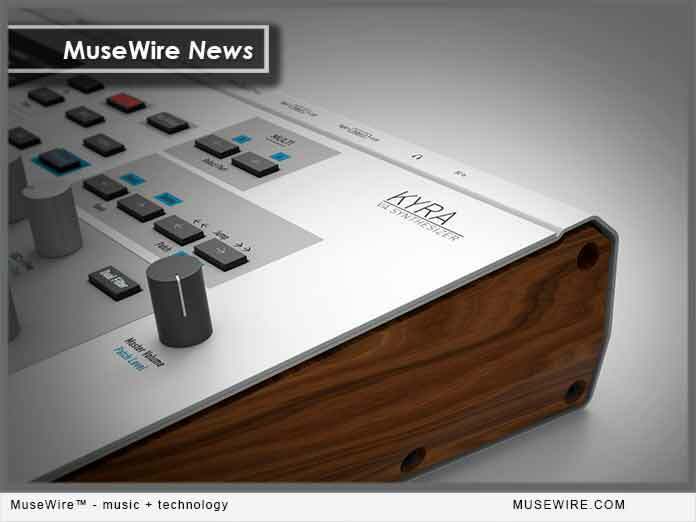 Kyra will have four assignable, balanced 32-bit/96kHz stereo outputs, a headphone output, low-latency DIN MIDI, a fully class-compliant USB2 implementation for MIDI, and a stereo 24-bit/96kHz audio stream for each of its eight parts. Production-wise, there is also a USB (Universal Serial Bus) audio return feature, so Kyra can render final DAW (Digital Audio Workstation) audio under ASIO (Audio Stream Input/Output). An ASIO driver is provided for Windows users while Mac support is out of the box. Audio demos on SoundCloud for the Exodus Digital Valkerie might give us a clue to some of the sound capabilities, but this would before the Waldorf spin is added to the technology and so is not the final Kyra product.